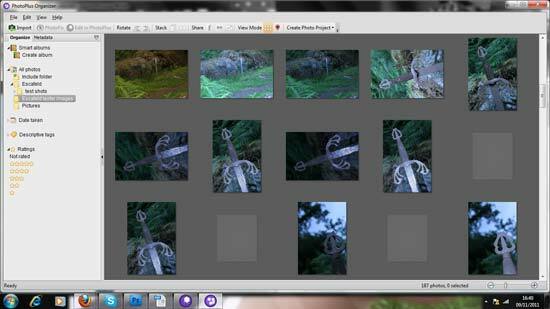 Serif Photoplus X5 is a photo editing suite that not only edits, manages and organises your pictures, but it can also convert RAW files and merge HDR images. Featuring new filters and an improved user interface, Photoplus X5 looks to be suitable for the low traffic photo editor looking for a budget alternative to Adobe Photoshop. Priced at £71.48, Serif Photoplus X5 is available for download from the Serif website here. 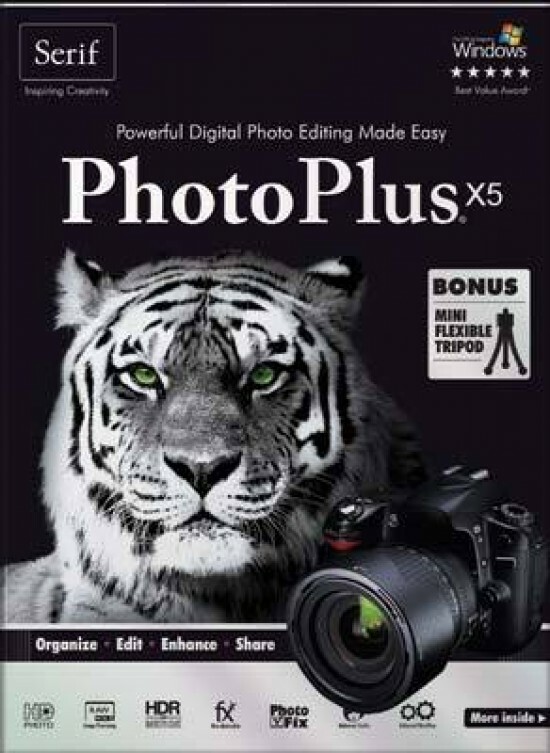 Serif Photoplus X5 can be either downloaded from the Serif website or bought as a hard copy CD which adds a small shipping charge to the price. We downloaded from the website which is a straightforward process and only takes a few minutes. Installing is also a standard affair and if you've ever downloaded any other software, it goes through similar motions. Once everything is ready, double clicking on the icon launches the application. A window that looks spookily similar to Photoshop appears on the screen with a smaller welcome window offering lots of things to do before you start. 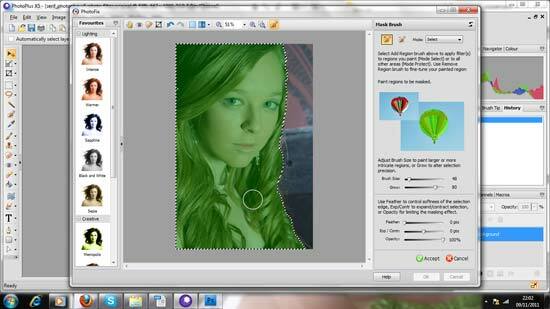 In fact, it reminds us also of Corel Paintshop Pro because there's a “How To” section on the left side next to the picture editing tools. Any of these options can be clicked into for tutorials and samples. 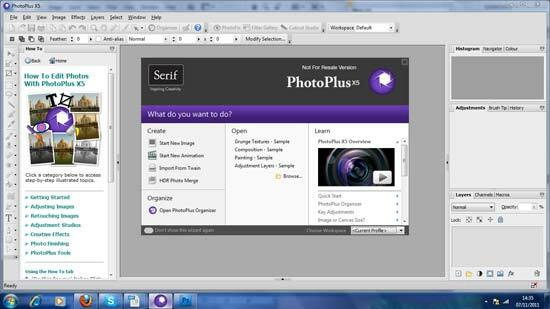 Serif Photoplus X5 is an upgrade from a previous version, so we'll concentrate mainly on what is new in this version. There are plenty of new things to do in Serif Photoplus X5. Some of the more interesting features include PhotoPlus Organiser, Photo Projects, visible current layer, improved and faster blending as well as adjustments for vibrancy, saturation and contrast. The Organiser opens in a different window and is well thought out. The left side is split into two tabs for organising and adding metadata. Pictures have to be imported first and it's not as straight forward as it looks. In fact we had some problems with it. At first the program wouldn't recognise any of our folders as valid import folders. We duly trawled the help sections and troubleshooting on the Serif website but ended up having to contact the Technical Department which works on a ticket system. We were contacted 1 day later with a response and they said that the import button is for retrieving pictures from a device. To import from a hard-drive, you have to choose the option Include Folder in Organiser located at the top of the file folder. Not the most intuitive description but we soon had loads of pictures loading up from our external hard-drive. As we said previously, the left side of the window has a lot of tools similar to Photoshop or GIMP. The right side is just like Photoshop with a histogram, adjustments, layers, history and channels trays as well as others. Maybe it's because of the similarity in appearance that we kept trying to use all the Photoshop short cuts such as shift - control - E to flatten layers or shift - control - S to save as. Neither of which work. Not that it's detrimental but we were surprised to see that save as doesn't have any short-cut. However, there are many short-cuts across the top of the window. There's a direct button to the Organiser as well as the Filter Gallery and the PhotoFix window which we really like. In this window there's a bunch of preset effects - 10 in total - for you to add to your pictures. A portrait is used as an example and we concur that this is the best type of picture to use simply due to the choice of filters on offer. To the right of the preview window, there's a whole host of custom additions you can make to your pictures and this is where Serif Photoplus X5 comes into its own. The layout is similar to other tagging/editing systems so there's nothing new but compared to the filter gallery, it works like lightning. Adjustments can be made using typical features such as curves and sharpening (which is very accurate and sympathetic to the shot) as well as a few more creative features such as lens vignetting and chromatic aberration adjustment. It's a great window and we wager that when using this system, you'll do 90% of your work in there. There's also a mask area which is very precise and easy to use. It employs a similar green area to Vertus Fluid Mask which makes it easier to see what you've masked and what you need to do or remove. We like the Photo Filter area and think it's possible that it saves the program from simply becoming one of the other many tagging/editing programs on the market today. There are plenty of dedicated programs that can deal with stuff such as noise reduction or HDR merging so it's worth knowing how good Serif Photoplus X5 is to see if it can standalone on a computer without having to stuff up your hard-drive with multiple programs. Noise reduction works very well. We prefer the layout to Photoshop because it has a larger default preview window but noise manipulation is very basic. If you want a comparison to the original, a split screen can be added by clicking the icon at the top of the page. We pumped it up to 100 pixels to see how the program handled it at full power and although it did well at removing colour noise, it also removed the colour in the subjects eyes. Being able to set the colours to remove would be more advantageous. Performing the changes takes a few moments which isn't all that bad - it's literally a matter of seconds - but is noticeably slower than Adobe. But then it's a massive price difference and this is a key point to remember. Removing the colour noise left us with salt and pepper noise and it's this lack of features that let's the noise removal area down. We couldn't get rid of this black & white noise which is a shame. We opted for a setting of about 25 pixels to get a decent balance of noise reduction and colour retention. 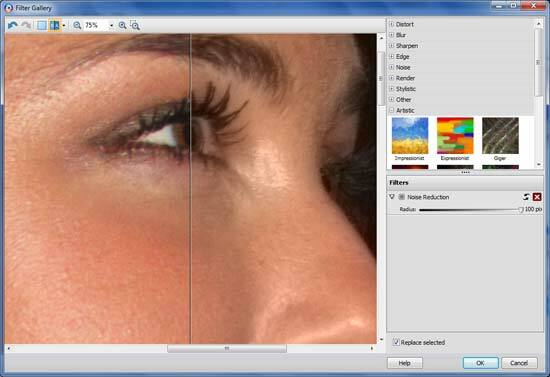 Looking at other more used features such as sharpening, it has a similar range of options to Photoshop. You can add a standard amount of sharpening, sharpen more, sharpen edges and there's an unsharp mask. In standard, it looks OK depending on if you've reduced noise before or after the sharpen. We recommend before to get the best results.